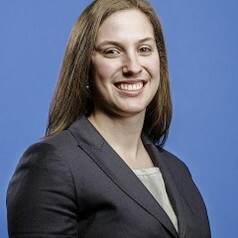 Megan Fasules is a research economist at the Georgetown University Center on Education and the Workforce. Her research uses the Occupational Information Network (O*NET), which focuses on connecting work competencies with the labor market. She also supports research efforts to help states integrate education and workforce data systems for evaluation and improved feedback between labor markets and education. Prior to joining the Center, Fasules worked as a researcher at the Financial Crisis Inquiry Commission. She also worked as the head research assistant at American University, where she conducted research on bankruptcy. Fasules earned her B.A. in mathematics and economics at Lake Forest College in Illinois and her doctorate in economics at American University. Her dissertation focused on evaluating the extent to which the implementation of Medicare affected personal bankruptcy. This dissertation looked specifically at the impact of Medicare on personal bankruptcy rates, medical debt at filing, and petitioner characteristics.